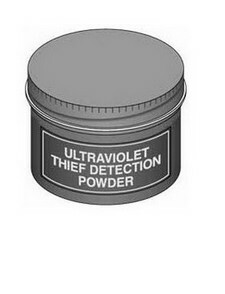 Ultraviolet Thief Detection Powder is designed for thief detection and the identification of stolen or altered items. For example, an article can be marked so that it is invisible to the eye, but under ultraviolet light the item and anyone who touched it can be identified. Powder, once touched, remains on fingers and hands, invisible except under UV light. Tampering, theft, substitution, etc., can be revealed as well as evidence against a suspect provided. Fluorescence is the phenomenon by which certain materials absorb ultraviolet energy and re-emit this invisible radiation in the form of visible colored light. Fluorescence occurs only while the material is being activated by the UV rays. Once the source of the UV radiation is removed, the fluorescent glow ceases. The best fluorescent responses occur in darkness or under low-level lighting conditions. This fluorescent tracer powder readily transfers to the fingers and hands when touched, leaving the subject "glowing" when put under UV inspection. Powder is recommended for indoor use; paste is recommended for most outdoor use. To make an ultraviolet paste, simply mix the powder in Vasoline. Ultraviolet powder and paste can be applied to locks, fire alarm boxes, off-limits door knobs, computer keyboards, etc. ; the list is unlimited, depending upon your security requirements. Volume: .25 oz. Non-toxic. Made in U.S.A. Recommended for use with the Ultraviolet LED Flashlight.